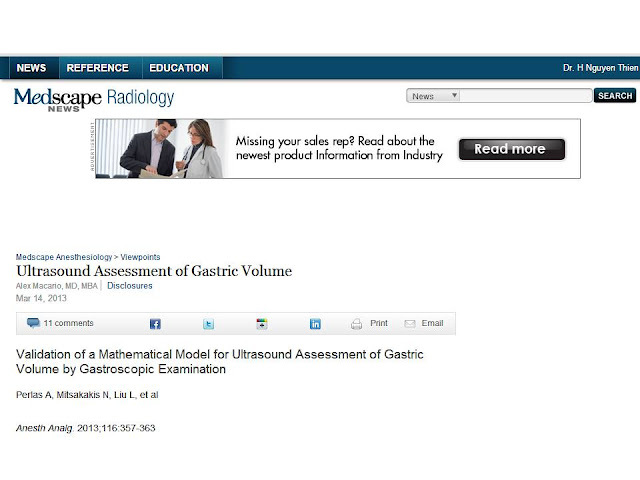 The goal of this study was to better understand how to accurately measure the volume of gastric contents using ultrasound. This information would be useful in the case of patients arriving for urgent surgery (such as after a motor vehicle accident), when pulmonary aspiration of gastric contents would be a serious perioperative complication. If it were possible to reliably identify patients with full stomachs, then specific measures such as nasogastric decompression and emptying of the stomach could be undertaken. Perlas and colleagues enrolled 108 patients undergoing elective upper gastrointestinal endoscopy (but not having surgery) after 8 hours of fasting. After a baseline ultrasound examination of their stomachs, patients were randomly assigned to ingest 1 of 6 predetermined volumes of apple juice (0 mL, 50 mL, 100 mL, 200 mL, 300 mL, or 400 mL). The ultrasound examination was repeated within a few minutes to obtain the cross-sectional area of the antrum because the larger the antrum, the greater the volume of gastric contents. To conclude the study protocol, the gastroenterologist then placed an endoscope and suctioned under direct vision. This gastric fluid was measured to the nearest milliliter. The overall result of the study was that a previously reported model tends to overestimate gastric volume, particularly at low volume states. A new, better mathematical model was developed to predict gastric fluid volume on the basis of measurements of the cross-sectional area of the antrum. This formula is: gastric volume = 27.0 + (14.6) x (cross-sectional area of antrum in right lateral decubitus position) – 1.28 x age, which shows a correlation of r^2= 0.731. The use of ultrasound to image the heart or to place peripheral nerve blocks is well-known to anesthesiologists. Another well-known clinical application of ultrasound is assessing the fetus in pregnancy. Ultrasound technology has proliferated in medicine and is attractive because it is noninvasive, using high-frequency sound waves to provide increasingly precise images. Portable bedside ultrasound devices are routinely used to facilitate placement of central lines, and now handheld devices are used to assess volume status in hypotensive patients in the intensive care unit. Ultrasound is also used in focused assessment with sonography for trauma to identify the presence of free intraperitoneal or pericardial fluid. At national anesthesia meetings, one may hear about ultrasound imaging of the bladder to determine the volume of urine or imaging of the airway to assess the anatomy. A novel use of ultrasound is imaging the stomach to determine gastric volume and related risk for aspiration. Imagine the victim of a motorcycle accident who comes to the emergency department and is urgently scheduled for an open reduction and internal fixation of the femur. The patient's mental status precludes a proper history. Even though the anesthesiologist plans to perform a rapid-sequence induction with cricoid pressure to reduce the probability that any gastric contents regurgitate into the trachea and be aspirated into the lungs, it would be nice to know whether the patient's stomach is completely empty or, at the other extreme, whether the patient has recently consumed a large meal. Solid stomach content is associated with a high aspiration risk and poor patient outcome. Although an ultrasound to visualize gastric contents might seem straightforward, there are important considerations such as the optimal patient position for imaging the stomach. The right lateral decubitus position is best. The gastric antrum can be identified in a sagittal to right-parasagittal plane between the left lobe of the liver and the pancreas, at the level of the aorta or inferior vena cava. The probe should be tilted as needed to ensure a proper transverse view of the antrum. One question that was not answered by the study is: How is it possible to extrapolate total stomach volume if you fail to measure the fundus and body of the stomach, which have many times the capacity of the antrum? I can imagine that in the not too distant future, ultrasound assessment of gastric contents will be part of the routine preoperative evaluation of surgical patients in whom an 8-hour period of fasting cannot be confirmed. As shown in this study, bedside ultrasound can be used clinically to differentiate an empty stomach from one with fluid or solid gastric content. The sonographic diagnosis of an empty stomach is qualitative; no volume assessment is required. When the stomach contains clear fluid, however, an estimate of the volume is of interest. Although there is no precise gastric volume over which aspiration risk increases, a volume of approximately 100 mL in the average adult is common in fasted individuals and is believed to be safe. Therefore, the method described by Perlas and colleagues to estimate the volume of clear fluid in the stomach will help differentiate negligible amounts from larger volumes that could place patients at risk for regurgitation and pulmonary aspiration. Age was discovered to be a confounding variable in measurements of gastric volume, and, therefore, this variable was included in the formula proposed by the investigators. A possible explanation is that older individuals have more compliant gastric walls than younger patients. In other words, a given cross sectional area corresponds to a lower gastric fluid volume in older vs younger patients. INTRODUCTION: Pulmonary aspiration of gastric contents is a serious perioperative complication. Previous models of ultrasound gastric volume assessment are preliminary and have not been validated by an external "gold standard." In the present study we propose a more accurate model based on prospective data obtained from 108 patients undergoing bedside gastric sonography and upper gastrointestinal endoscopy (UGE). METHODS: Patients undergoing elective UGE were randomized to ingest one of 6 predetermined volumes of apple juice after an 8-hour fasting period. A cross-sectional area of the antrum in the right lateral decubitus position (Right lat CSA) was measured by a blinded sonographer following a standardized scanning protocol. Gastric fluid was subsequently suctioned under gastroscopic vision during UGE performed by a blinded gastroenterologist and measured to the nearest milliliter. CONCLUSIONS: We report a new prediction model to assess gastric fluid volume using standard 2-dimentional bedside ultrasound that has several advantages over previously reported models.